If you are a recovering alcoholic or addict, or are still in the grips of active addiction, we don't need to tell you how hard it is to function on par with one’s peers who do not have a history of abuse. Alcohol and substance use disorders make even the most menial of tasks difficult to accomplish. Even people who are, comparatively speaking, functional addicts and alcoholics struggle to hold down jobs and contribute to society. Even if one does manage to muster up the strength to get out of bed in the morning and to work, his or her efficiency and productivity is far below those who do not have a problem with drugs and/or alcohol. Aside from being partially or fully impaired while on the job affecting one's work productivity, the ability to do good work is even more diminished by the fact that one must exert extra effort to hide their condition from co-workers and management. Hopefully, if somebody presents themselves as having a problem with mind-altering substances at work, it will lead to co-workers encouraging them to seek help. Yet, that is not always the case. In certain fields of work, substance use and abuse could be described as a systemic problem. In some ways viewed as just being a part of the job. 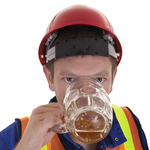 New research suggests that the prevalence of employees with substance use disorders is twice the national average in the field of construction, entertainment, recreation and food service businesses. The findings come from an analysis and survey from the National Safety Council, NORC at the University of Chicago and Shatterproof (a national non-profit focused on addiction). In a given year, people with substance use disorders are absent from work almost 50 percent more days (up to six weeks per year) than their peers, according to a National Safety Council press release. What’s more, workers with substance use disorders were found to be less productive and rack up higher healthcare costs, compared to work peers without a disorder. The analysis showed that untreated substance use disorder costs about $13,000 per employee working in the information and communications sector, compared to $2,000 for employees working in agriculture. Those who misuse or abuse prescription drugs have three times higher healthcare costs, compared to other workers. Yet, despite the apparent dangers of prescription drug abuse, with around 100 deadly overdoses daily in the United States, employers don’t seem to be all that concerned about it. The survey showed that 71 percent of employers reported issues with employees using prescription drugs, just 39 percent believed it was a threat to safety and only 24 percent had issue with it, the press release reports. However, the research shows that employers have a vested interest in helping their employees seek help, saving them [employer] as much as $2,607 a year. "Businesses that do not address the prescription drug crisis are like ostriches sticking their head in the sand," said NSC President and CEO Deborah A.P. Hersman. "The problem exists, and doing nothing will harm your employees and your business. As the tool shows, the cost of inaction is far too great." "The most significant finding that is new and may be surprising to employers, is that workers who are in recovery, who have received treatment at some time in the past, but who are not currently abusing substances, are less likely to leave their employer, use less unscheduled leave and use fewer health care resources than co-workers with an untreated substance use disorder. This finding stands up for every one of the 16 industry sectors. Supporting workers to treat substance use disorders is cost effective for employers." That being said, if you know that your alcohol and/or substance use has become untenable, leading to significant unmanageability in your life, then you do not need to wait for someone to point out your problem to seek help. A preemptive strike or, rather, seeking assistance on your own volition in most cases leads to more successful outcomes, compared to those who are told to go to treatment or look for a new job. Recovery is possible, contact Hope by The Sea to begin the process. We can help you break the cycle of harmful drug and alcohol use, and show you that you never have to use mind-altering substances again. There is no time like the present.